Carrotmob – Rewarding Local Green Businesses! So, what the hell is a Carrotmob? In a Carrotmob campaign, a group of people offer to spend their money to support a business, and in return the business agrees to take an action that the people care about. Instead of organizing boycotts, we offer to spend money as a group if a business agrees to make a socially responsible change. We are called Carrotmob because we use the “carrot” instead of the “stick” method of encouraging behavior. Traditionally, people who wanted to influence businesses would threaten or attack them. We believe people can have more influence on businesses by giving them a positive incentive to change: our money. The crazy part is that it actually works! Carrotmob organizers have already created a growing movement, with over 175 campaigns all over the world! Join us. Why should we take the time to vote? Carrotmob is the perfect project for the ‘slacktivist’, people who care about an issue but are only willing to put in a minimum amount of effort. Voting online and then going out to eat and drink at the winning venue on mob day, requires minimum effort and will directly result in positive change. We tend to forget how much power and influence we have as consumers. As a community we can choose to reward those business’ that are doing the right thing and avoid the ones that are not doing their part to minimise their carbon footprint. When will the mob take place? Voting closes this Sunday the 18th March so there are only a few days remaining! So watch the videos and vote here! Then we will be working with the winning venue to determine which date works best for them. We are aiming for the first week of April. How did the businesses react when you approached them about the Carrotmob? It was very mixed, some saw the potential of the project straight away; lots of free marketing and then the possibility of additional revenue, and immediately said ‘where do I sign up?’. Others showed an alarming lack of concern or interest for anything related to sustainability… Although I’d love to name and shame them, I’ll just say that many of the high profile bars and restaurants in Perth that are charging top dollar, don’t even recycle their glass bottles and literally throw hundreds into landfill ever day! Most people wanted to do the right thing but didn’t really know how so there seems to be a major lack of information and education out there. I have noticed that all these restaurants are in the Perth City area. Will there be more mobs in more suburbs once this round one has finished? For this particular project we submitted an application for an environmental grant to the City of Perth. We were awarded the grant and therefore the competition needed to be run in the City of Perth boundaries. We have a lot of feedback from people that have voted that have requested more information on holding their own Carrotmob, which is exactly what we were hoping for! It is designed so that anyone can do it, even if you don’t have a budget. We certainly hope that people like what we are doing and would like to carry it on in their local area! So why do you think it is so important that consumers choose to buycott rather than boycott? I think anything that has a positive reinforcement is going to work better than something which is negative. It just feels nicer when everybody wins. Lets face it consumers can’t live with out providers and visa versa, so we should work together for the greater good of all. Something I have noticed is that consumers complain that businesses use unsustainable practices so they have no choice but to buy ‘bad’ products yet businesses complain that consumers don’t want to pay the extra cost that is sometimes associated with choosing ethically. Seems to be a chicken or the egg situation. Who do you think needs to take the first step? I really commend businesses that pave the way to change, it can mean isolating yourself in the beginning and perhaps having a niche market for a period of time, but as the demand for sustainable products and services grows, so will the supply and in turn they will become more available at a more affordable price. As for consumers, I understand what it is like to be on a budget and if you can just get a few items or services when you shop that are sustainable it all helps towards the shift we are aiming for. In the documentary Food Inc, they mention that when you go to the check out, you are voting for what you want to see on the shelf, that really resonated with me. What are your top tips for becoming an ethical consumer? Start local! Support local business – it’s great for the community and it cuts down on that carbon footprint. STOP using plastic bags! Plan ahead, take your own bag, or ask for a box at the shop. Don’t buy bottled water, get a reusable non-plastic vessel. Same goes for take away coffee, get a keep cup. Ask at your local restaurants, bars, cafes what they are doing, do they have a ‘Green mission statement’. The more people that ask about these things, the more owners will realise it is of importance and will get in the market for your ethically, sustainably conscious business. REDUCE, Reuse, Recycle – In that order of importance. 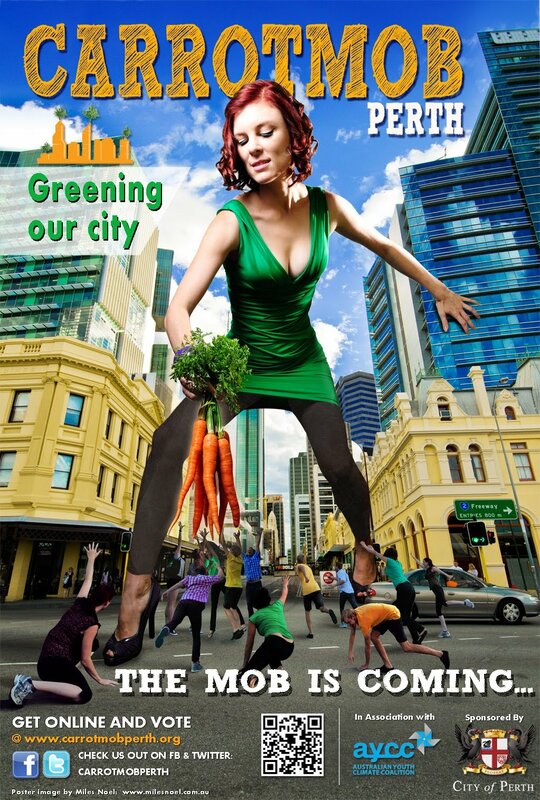 A big thank-you for Dom and all the other dedicated Carrot Campaigners for all your hard work in making Perth a greener city. Now get involved! Follow the Carrotmob on Facebook or via their website. Share it with friends and family. For those of you who aren’t on my facebook page or my twitter, you may not know about my latest gig. I am really excited to announce that every Wednesday I will be blogging for the Conservation Council of Western Australia on all things sustainable. If you have any particular topics that are of interest, please let me know so that I can maybe look into it! 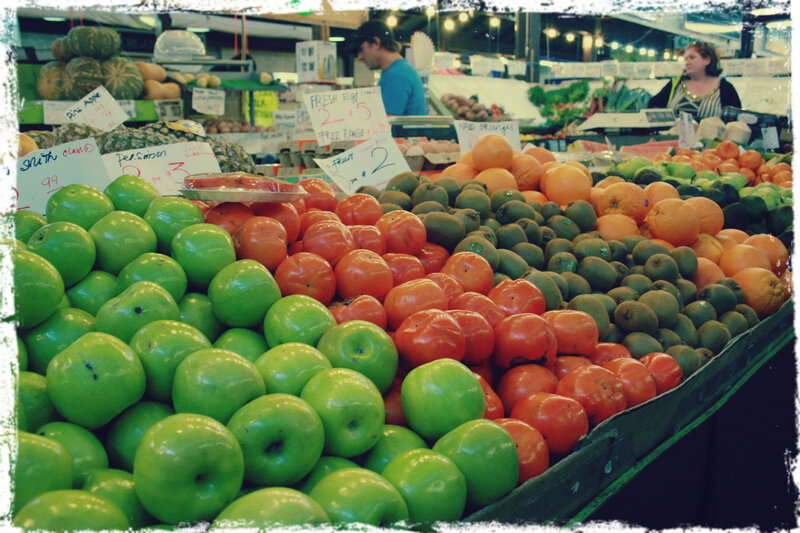 This weeks post is all about the importance of organic food and how vital it is for a health body and a healthy planet. It has been suggested that the reasons children are particularly susceptible to the additives in food is because the recommended intakes are set at adult levels rather than child. I also find it interesting that cancer patients are recommended by doctors to eat only organic produce. Organic food is grown naturally – as nature intended – and because of this has much more vitamins, minerals, micro-nutrients and enzymes than produce farmed conventionally. 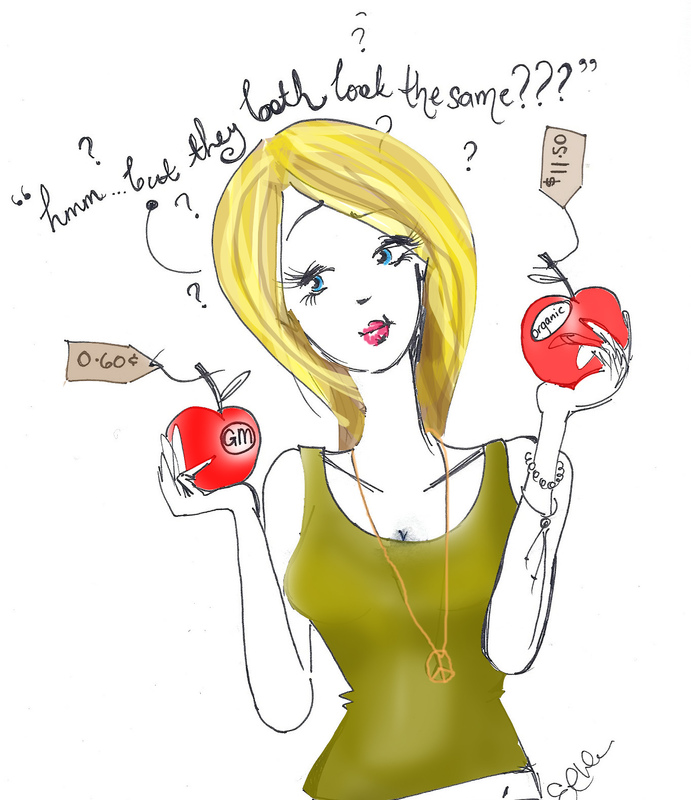 I must admit – I thought the whole ‘organic’ movement was a bag of baloney… until I tried it. I couldn’t believe how quickly I felt and saw a difference. I don’t care how many studies you show me against it, I am literally going with my gut on this one. If you want to look into making the switch to organic living you can also see this blog post which gives tips even if you are on a budget. 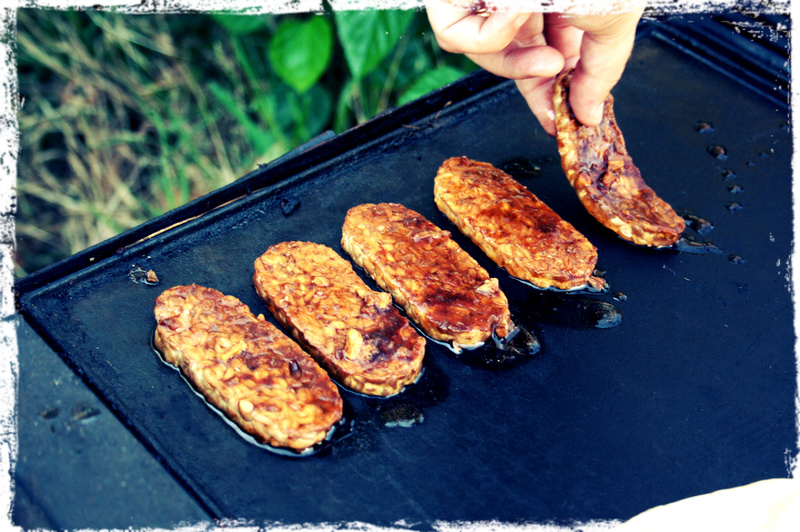 I get asked a lot what Tempeh is and the best (more appetising definition) that I can give is that it is Tofu’s healthier cousin. Now for the gross technical term. It is fermented whole soybeans which sounds disgusting but actually just means that it is full of probiotics as well as other nutritious goodies like manganese and copper. It is also a fantastic source of protein and fiber. Did you know…? 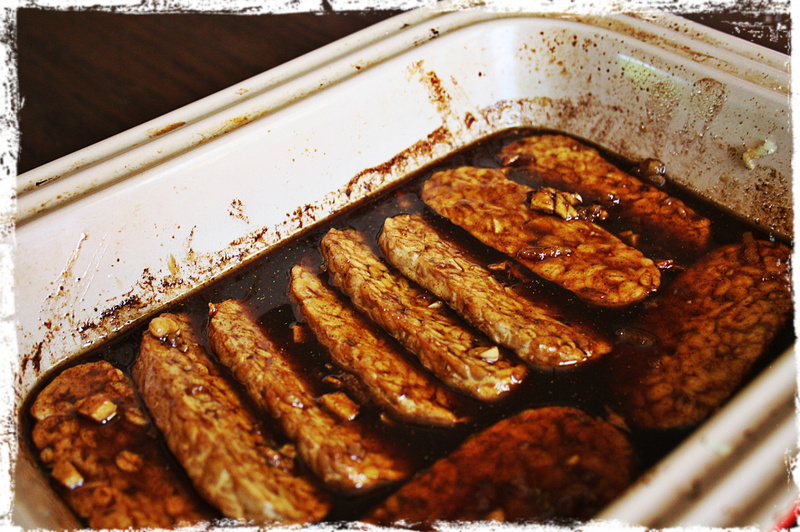 Soy products like tempeh have been shown to lower cholesterol levels (by approx. 30%) and lower LDL aka bad cholesterol levels by as much as 35-40%. All these reasons make it a great meat substitute. Cover and refrigerate for 24 hours – at the very least 12 hours! 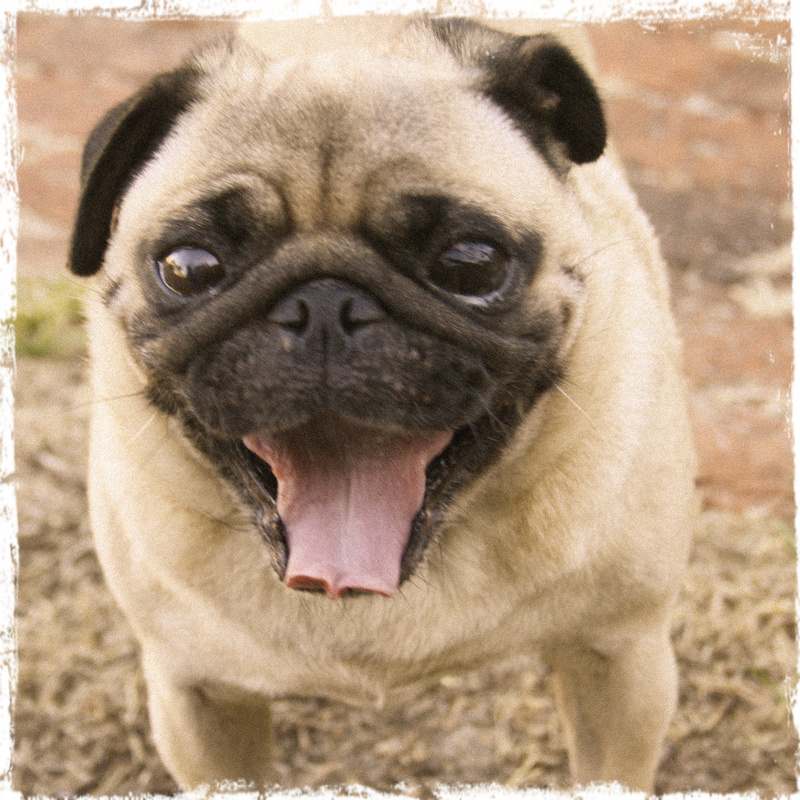 OMG – THAT SMELLS AMAZING! Add greens, avocado and sweet chilli and you are in for a treat! 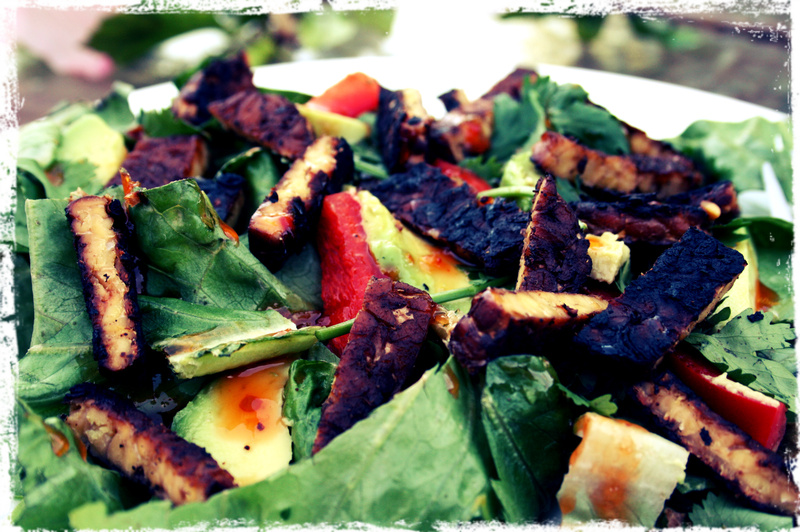 Asian Fusion Salad (pictured) – Cut the grilled tempeh into squares and serve with a simple salad of lettuce, red capsicum, avocado, coriander and sweet chilli sauce for a light summer dinner. 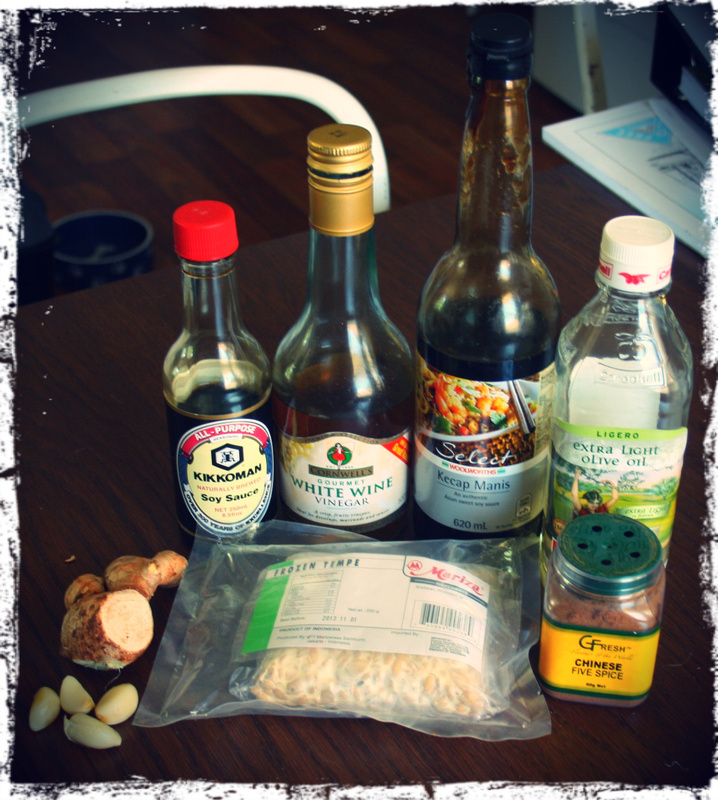 Stir-Fry – Cut the uncooked tempeh into strips and stirfry in wok with some peanut oil. Add broccoli, snowpeas, bean shoots and bok choy with a splash of the marinade. Dress with chopped peanuts and coriander. 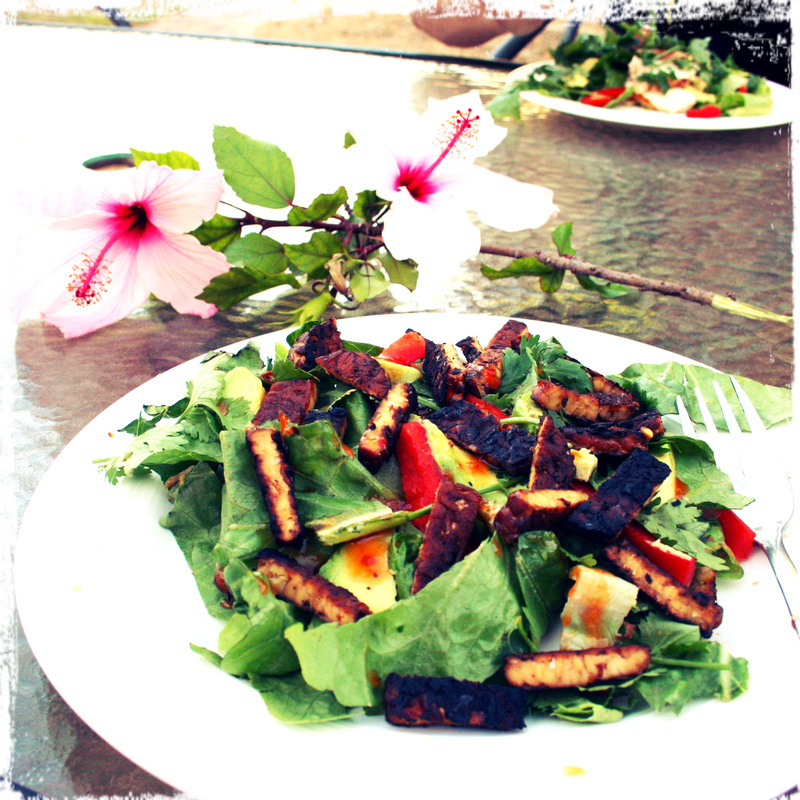 Burger – Leave the cooked tempeh in ‘steak shape’. Fill a wholemeal bun with lettuce, grated carrot, cucumber and avocado. Add tempeh and sweet chilli. Serve with homemade chips and salad for a heartier meal. Let your imagination run away with you – so many options, so little time! Don’t just throw away the marinade at the end of the meal. Either use it as the oil for your cooking or marinade something else in it the next day. I have chunked up squares of hard tofu and cannot wait to get home and make a great stir-fry out of it. My husband also stole some for his dinners. It is common knowledge that organic produce is more expensive than your conventionally grown (read; chemically assisted) fruits and veggies. And, while it is not surprising that the extra time and care increases the cost to the consumer, that doesn’t exactly help when you are on a tight budget! Is organic really that good? 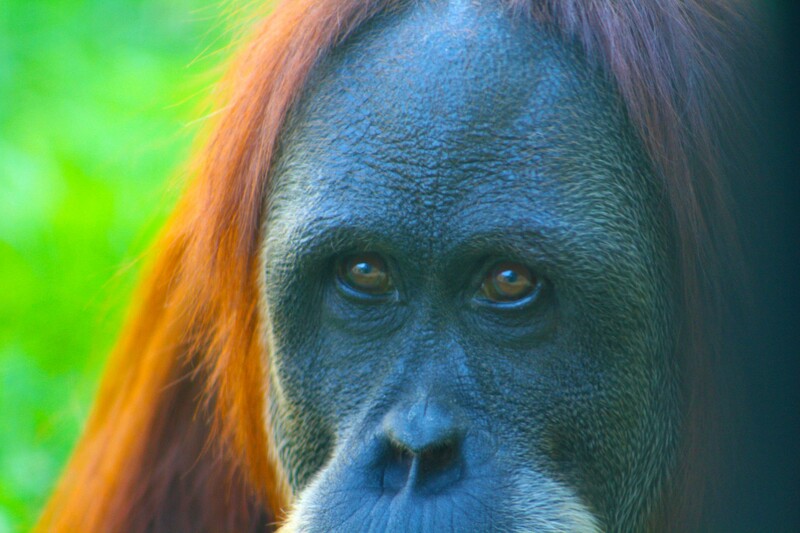 Palm Oil – What the hell is it and why is it bad?